Kumquats ripen within a month from green to brilliant orange. Once mature, the fruit can reach up to 2 inches in length. On the Interior, the fruit resembles miniature juicy orange-like segments that are deliciously sweet yet tangy. Kumquat is eaten along with its peel, a unique feature that differentiates it from other citrus family fruits. Source: South Asia India, Japan, Philippines. Handling:Kumquat fruits possess very good keeping quality. They can be stored at room temperature for about 3-4 days, and inside the refrigerator for up to three weeks. 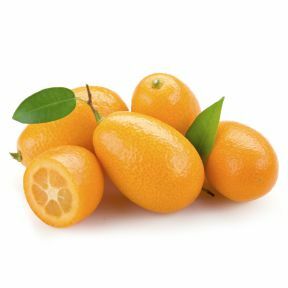 Varieties: Nagami (or oval kumquat), Marumi (or round kumquat).